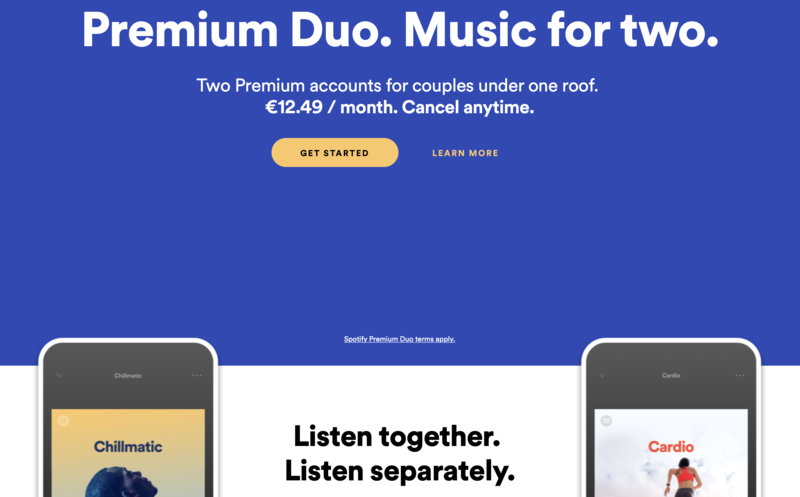 Spotify just started selling a new subscription in Ireland called Premium Duo, as The Verge spotted. You guessed it, this subscription tier is designed for couples, roommates and all combinations of two persons who live under the same roof. It is a bit more expensive than a Premium account and a bit less expensive than a Family account. If you have three or four persons in your family, a Premium for Family account makes sense. For $14.99 per month (or €14.99, £14.99), you can upgrade up to six different accounts to Premium. But what if you’re just two persons? Many people choose to share a single account because it only costs $9.99 per month (or €9.99, £9.99). There are some drawbacks, and it is against the terms and conditions of the service. For instance, if you only have one normal Premium account, you can only play music on one device at a time, so you might pause music on your friend’s device when you start playing music. Duo fixes this. With Spotify Duo, the company would introduce a new price point at €12.49 per month — it would likely cost $12.49 in the U.S. and £12.49 in the U.K., but it’s only available in Ireland for now. The only requirement is that you need to live at the same address. Based on Spotify’s website, the system works just like Premium for Family. Every user creates a separate Spotify account; the person who pays the bill can send an invitation link so that others can join your group. You can unlink your accounts whenever you want. It’s clear that the company targets people who share the same account. “And because you’re now on separate accounts, music recommendations are tailored to your individual tastes,” Spotify says on its website. That’s why the company is also adding a new feature called Duo Mix. This is a shared playlist between the two members of the Premium Duo account. It features songs that you have both liked. You can choose between a chill mix and an upbeat mix. You can also filter out explicit content. Let’s see if Spotify manages to increase the subscriber base with this new option. In its latest earnings release, Spotify said that the average revenue per premium user was €4.89. Family plans seem to be incredibly popular already. Update: I got a bit more information on Premium Duo. In addition to Ireland, Spotify is testing this new offering in Chile, Colombia, Denmark and Poland. In addition to Duo Mix, you’ll also be able to share your entire library of playlists in one click with the other person sharing your Duo account. There will also be a Duo Hub to manage accounts, edit your home information and view settings.